For over fifty years, L'Engle has been delighting and inspiring readers with her warm, eloquent prose, and inspirational poetry. She continues this tradition with Bright Evening Star, a personal reflection of the mystery and majesty of the Incarnation of Jesus Christ. 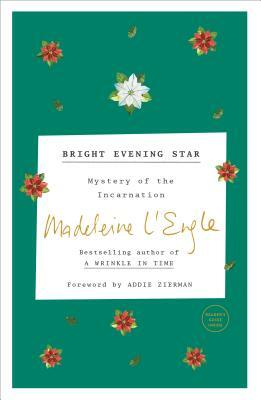 Bright Evening Star provides a glimpse into the life stories of this prolific author and her encounters with God. With a foreword by John Tesh, L'Engle invites us on a spiritual adventure that leads to hope, joy, and a closer relationship with Jesus. "Christmas," says Madeleine L'Engle, "should be a time of awed silence." If you're looking for a unique and Christ-centered Christmas meditation, Bright Evening Star will be a rich and delightful discovery -- year round! "In this warm and welcoming book?Madeleine L'Engle steers us away from the sterile, intellectual approach of Christian scholars and unravels God's entrance into this world with stories and personal reflections. She tosses aside the hat of a theologian and adorns herself in the flowing robes of a host, beckoning us to explore with her the Incarnation of Jesus Christ." "L'Engle's Bright Evening Star moves from the mysterious, imaginative faith of childhood, through doubt, inquiry and evolving understanding, to the deep and knowledgeable faith of spiritual maturity--truly, the Incarnation played out in a human life. You'll find your own story here."